Vancomycin-resistant Enterococcus (VRE) infections are especially aggressive and have been associated with mortality rates approaching 60% to 70%. They are now the second-leading cause of nosocomial infections in the U.S., and their prevalence is increasing worldwide. Resistance to vancomycin has the potential to be transferred from bacteria to bacteria. Cross-resistance is mediated by plasmids and transposons, which may transfer the genes associated with resistance to other much more aggressive pathogens, such as staphylococci and streptococci. Three principal types of vancomycin resistance are found in Enterococcus spp. ; VanA, VanB and VanC genotypes. VanA and VanB types account for most significant infections in clinical settings, involving E.faecium and E.faecalis. VanC resistance is a low-level intrinsic resistance found in other Enterococcus spp. 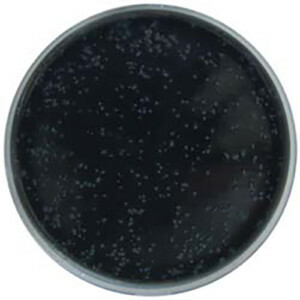 The Colorex™ VRE media is another chromogenic media in the Colorex™ range, enabling presumptive identification of vancomycin resistant Enterococci by the formation of mauve/pink coloured colonies (for VanA and VanB genotypes) and blue coloured colonies (for VanC genotypes) after 18-24 hours incubation.